I’m not sure what I want to call these, but whatever their name may be, they are delicious. These minicakes were one of those happy little accidents that (for me) rarely ever happens in the kitchen. I had far too much pumpkin pie filling left over after baking 2 pies, and decided to make a little concoction of pumpkin filling and snickerdoodles. The results, well, too bad you weren’t there to eat them with me. I think I ate half the batch in two days. Thanks to the park days ladies who helped me polish them off. Download the printable recipe card HERE. Cream butter, sugar and egg. Beat well. Sift together dry ingredients and mix into butter and sugar mixture. Press about 1 large spoonful of dough into bottom of cupcake cups. Preheat oven to 325º. In a large bowl, combine pumpkin puree, brown sugar, flour, cinnamon, nutmeg, cloves and salt and whisk until smooth. Add the cream, maple syrup, eggs and vanilla and whisk until just smooth. Pour 2-3 tablespoons of filling onto dough. 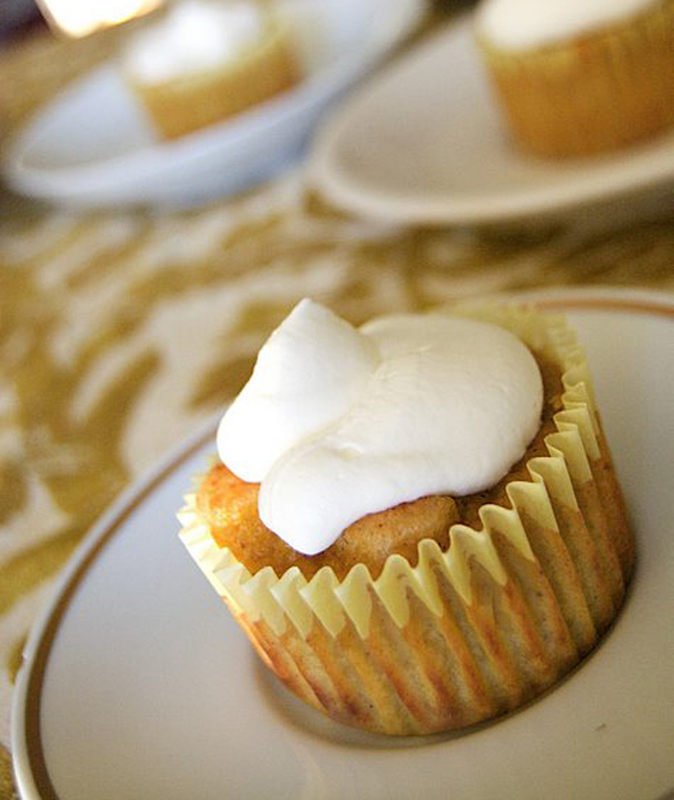 Bake cupcakes about 20 minutes, or until lightly browned. Chill and serve with maple whipped cream: 1 cup heavy cream with 3 tablespoons of maple syrup until soft peak forms. *Notes: I used fresh pumpkin. To prepare, preheat oven to 425ºF. Cut the pumpkin in half and place it cut-side down on a baking sheet. Roast until tender, 50-60 minutes. Remove from oven and puree in food processor or blender until smooth. Also, if you don’t have maple syrup on hand, a traditional pancake syrup works well, too. If anyone has ideas on what this thing should be called, speak up! Mmmmm, looks finger lickin! I like the name you had-Pumperdoodles. These look to die for! I love it that they have a filling. It’s almost like a little surprise on the inside. Thanks for the recipe card as well. You always seem to think of everything! I can’t wait to make them! They look delish! I really can’t get over how creative you are! I agree–those look delicious! And by look delicious, I partly mean that I’m jealous of your camera and your photography skills. It puts my own attempts on my food blog to shame. I think if anyone would be fantastic at this, it would be you! Ahhhhh, dang, I KNEW I left Park Days too soon!!! YUMMY! I’m a HUGE pumpkin fan. When you say “Pour 2-3 tablespoons of filling onto dough”, do you mean in each muffin cup, or in the whole batter prior to pouring in the cups? If you mean in each muffin cup, are they supposed to be a filling or are they the top layer of the muffin? Wow, Thanks for the prompt response! They were soo good, especially out of the oven. I found i had to put them in for an extra 7 mins to get the pumpkin a little more firm. You were right about the cake and pumpkin coming together and somewhat marbleized. Random question: I’m starting my own blog to share health and fitness tips. Do you find it hard or easy to post regularly?